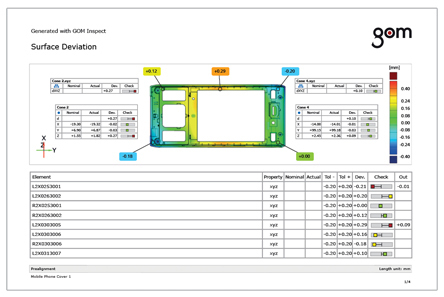 GOM Inspect contains all evaluation tools for an extensive analysis of parts and components. The software provides a variety of inspection tools for dimensional analysis of 3D point cloud data from optical scanners, CT scanners, laser scanners, CMMs and other sources. With over 100K downloads, GOM Inspect allows colleagues and clients to share the results of a quality inspection process, thus offering faster and effective communication in the decision making process. The software has been tested and certified by both the German and American National Measurement Laboratories (PTB, NIST) as a Class 1 measurement software. This denotes that the accuracy is in the class of smallest deviations in measurement software. 3D meshes generated from point cloud data can be imported into GOM Inspect for visualisation, reverse engineering, CAD comparison and general inspection. The polygon meshes can be exported into a number of different formats, including STL, G3D, ASCII, JT Open and PLY. As the mesh is processed using a complex curvature based algorithm, polygon meshes can be altered from smoothing, thinning and refining functionality. Gaps and holes within the mesh can also be filled into order to create a fully watertight 3D model, whereby the software prepares a live preview of each alteration. In addition, a golden mesh can be produced by finding the best mesh. GOM Inspect allows for CAD file imports from a range of different formats, including JT Open, STEP, IGES, CATIA & Solidworks files. Measurement plans can also be taken in by the software in formats of CSV, DMI, ASCII, IPP and FTA to work as the basis of inspection. The simplicity of GOM Inspect allows for a drag and drop of CAD files into the software, in which are automatically identified and assigned by the software. Standard alignment functions are all contained with GOM Inspect software, including alignment via RPS, geometric features, local co-ordinate systems as well as global/local best fit. Any customer specified alignment is well within the functionality of the software. Polygon meshes can be aligned and compared to CAD data or technical drawings. This allows for an analysis of part surfaces, as well as 2D inspection such as sections, planes, lines and circles. The surface comparison heat map is the standard inspection function when searching for part defects. The software conducts GD&T analysis in conformance with ASME and ISO standards. Functionality such as parallelism, cylindricity, flatness, two-point distances, position tolerance and thickness are all possible within GOM Inspect. The GOM software is inbuilt with trend functionality that makes evaluation of multiple parts or stages possible within a single project. Statistical Process Control (SPC) is supported, with values of Cp, Cpk, Pp, Ppk, Min, Max, Avg & Sigma contained within GOM Inspect. The airfoil inspection functionality consists of general inspection functions tailored for application specific evaluation. In the case of inspecting airfoils & turbine blades, GOM Inspect offers quality control functions such as profile mean line, profile centroid, profile thickness and 2D sections. The profile’s radii, twist and gravity can also be calculated. GOM Inspect provides construction functions for curves and visualisation to show individual properties. Edge curves can be captured, radii and character lines analysed, and spline curves can be constructed. 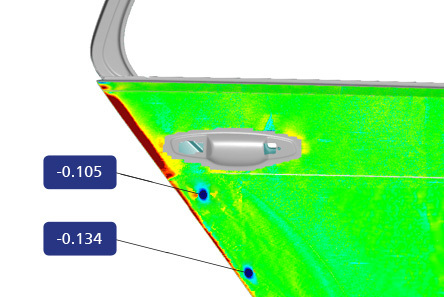 An important function of curve based inspection is the ability to provide flush and gap analysis, proving to be an integral inspection tool in the Automotive Industry. Surface inspection is greatly enhanced from the new functionality of the surface defect map. Small defects become visible in a displayed colour plot, making it much easier to detect sink marks and dents within the part. The surface defect map works directly on the mesh, as the software computes a theoretical surface for realistic results. GOM Inspect’s reporting module gives user the opportunity to generate reports containing relevant inspection information. This includes images, tables, snapshots, diagrams, text and graphics. Alterations to the inspection of the part can also be updated in the report automatically without tedious editing. The report is exported in a PDF format, with templates available to use or create to suit your inspection process.